Cloud Climbing Beauty: C10 Best Buys - Don't miss out! I hope you are all having a good week. I'm trying to go in too many directions lately and wishing the days were twice as long so I can get everything done! Pg. 23, Far Away Eau de Parfum Spray is LPE of $9.99. Pg. 33, Sweet Honesty Cologne Spray is Lowest Price This Year of $5.99. Pg. 39, Luck for Him Eau de Toilette Spray is $14.99. Pg. 41, Ultra Color Indulgence Lipstick is intro special of $4.99 and Ultra Color Absolute Lipstick is LPE of $5.99. Pg. 42, Mega Effects Liquid Eye Liner is $4.99. Pg. 49, Mix and Match from six of our mascaras - any 2 for $7.99. Pg. 61, Anew Age-Transforming Foundation is $10.99 and Ideal Flawless BB Beauty Balm Cream, perfect for summer as moisturizer, treatment, and color are combined, is $7.99. Pg. 64, Be Blushed Cheek Color, available in 8 colors, is $4.99. Pg. 73, Anew Clinical Pro+ Line Eraser Treatment - new and improved - is intro special of $24.99. Pg. 75, Anew Genics Eye Treatment is Best Offer Ever of $19.99. Get it while it lasts, as this line will be discontinued after C12. Pg. 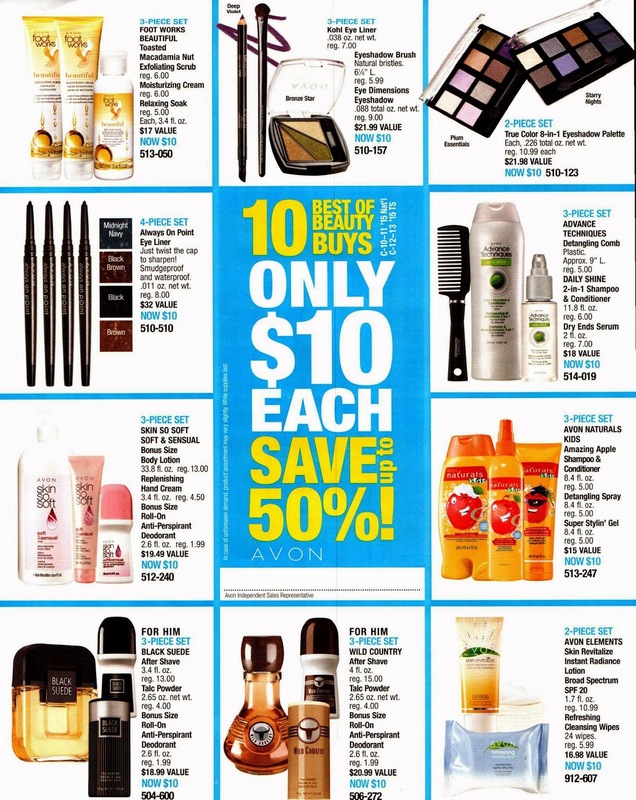 77-81, Anew Platinum, Reversalist, and Vitale lines are buy one get one for $5 - mix or match. Pg. 83, Anew Clinical Advanced Retexturizing Peel is LPE of $13.99. Pg. 84, Anew Clinical Absolute Even Multi-Tone Skin Corrector is LPE of $26.99 and Spot Correcting Hand Cream SPF 15 is LPE of $6.99. Pg. 89, Avon Elements Youth Restoring Multi-Purpose Lotion & Serum Broad Spectrum SPF 20 (whew! what a long name! ), is LPE of $7.49. Pgs. 134-145, Don't miss the "Now or Never!" items on these pages, as they will be gone soon. Pgs. 173-Back Cover, Full Size Hand Creams in three SSS formulas, Silicone Glove, or three Moisture Therapy formulas are each LPE of $1.69.